430 Rocking Horse Drive – Bozeman, Montana – Lifestyle, location, and possibilities are key factors in determining where we choose to live. The Greater Bozeman Area is arguably one of the country’s top lifestyle choices due to its two ski areas, Blue Ribbon trout streams, numerous mountain trails for hiking, biking, hunting, camping, and winter sports, along with a community known for friendliness and thriving businesses. 430 Rocking Horse is a property that will satisfy anyone seeking endless possibilities right out their own back door. Situated in Cameron Bridge Estates, with access to 340 acres of state lands including the renowned Gallatin River, this home is a playground for those wanting to enjoy the best Montana has to offer. This gorgeous 3,743 square foot custom home and 1,320 square foot guest apartment are located on 12.72 acres. The spacious front yard of this attractive property features rolling lawns, a meandering creek, and is bordered with both Jack Leg and wire-and-rail side fencing. The backyard has lawns big enough for ball games, as well as entertaining areas, a dedicated children’s play area, a greenhouse with outside cupola seating, a fenced vegetable garden, and beautiful perennial beds. The back of the property transitions from lawns, to meadows, then to thick forests of cottonwoods and aspens. Trails have been created through the woods for ATV fun, with a small sleeping cabin and firepit at the edge of the woods. The trails lead through wetlands filled with birds to state lands access bisected by the Gallatin River. It’s a perfect area to hunt, fish, target shoot, snowshoe, cross-country ski, camp, and then roast s’mores over the firepit right out your back door. The 5-bedroom main home and 1-bedroom guest apartment were designed by Locati Architects and built in 2004 by SBC Construction. 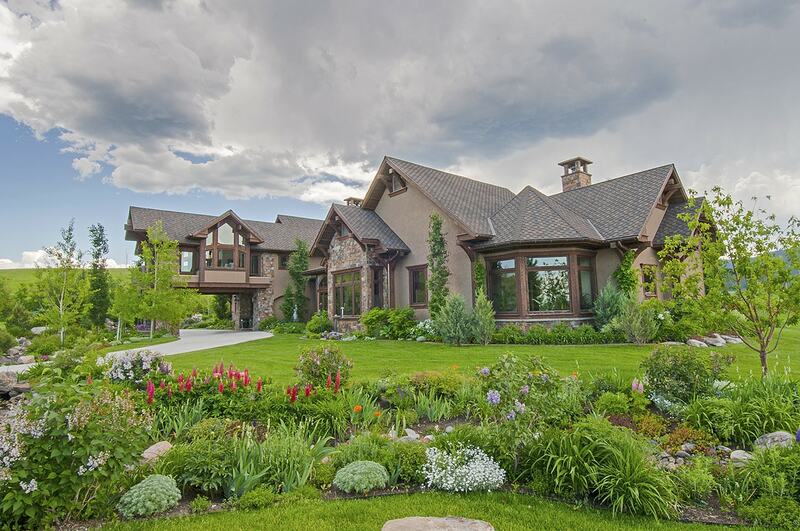 Every detail about this beautiful Montana-style home has been optimized for both livability and maintenance, beginning with the driveway. From the paved street, a wide, easy-to-plow concrete driveway follows the front lawns before branching off to access either the home’s front door and attached garages, or the detached second garage and guest quarters. Lovely perennial beds border a flagstone patio and cement walk that connects to the main home to the guest apartment and garages. Both structures enjoy a circular flow with driveways and walks insuring accessibility any time of year. The home and detached garage/guest apartment’s exterior is both organic and timeless, while being Montana through and through. Stacked stone is used at the main home’s entry and accent areas, with cedar board and batt siding as well as shake shingles comprising most of the exterior. Off-white clad windows are set off by an earthy olive-brown shade of wood stain. With generous parking, the front drive has an inset area of poured concrete resembling bricks in both pattern and coloring. Bordered by manicured flower beds, a cement walkway leads from the drive to an oversized Alder wood front door under the eaves of the charming covered porch. Paving-stones compliment the exterior stone walls with timber pillars for accent. The welcoming front foyer divides the home into public and private wings, with French doors leading to the central family room directly across from the front door. The family room’s large picture windows display a vast Montana landscape of lawns and forests beyond. The Great Room, occupying the main level’s south wing, is immediately inviting for guests and family. An 11-foot-high stacked stone fireplace with stone hearth and timber mantle anchors the room on the south wall. The vaulted tongue-and-groove ceiling is set off by two open timber trusses. Floor-to-ceiling windows take up the entire east side of the Great Room, opposite the kitchen and dining areas. The organic feel of the home’s exterior continues inside with hand-troweled plaster walls and ceilings, reverse circle-sawn fir floors, and Alder wood used for doors, wide-base trim, and custom cabinetry. The wall colors are primarily neutral with sienna red accents, and varying ceiling heights add drama to the space. Kitchens are meant as gathering spaces and this one is ideal. Open to both the living and dining areas, the kitchen also has its own set-back work area with wrap-around extra-thick granite counters featuring a decorative marble tile backsplash and a kitchen sink with a view. The kitchen features two islands, the first is a large butcher block with a bar sink, while the other is a bridge with bar seating between the kitchen and dining areas. The top-of-the line appliances include a Wolf 6-burner range with grill and two ovens, a Sub Zero refrigerator with wood panels and thick metal pulls matching the cabinetry, and a beverage refrigerator with glass doors. Between upper and lower cabinets and the big walk-in pantry, there is abundant storage space. Two china cabinets with upper crinkle-glass doors are recessed into the dining room walls and provide even more storage as well as a prime place to display treasured items. Just off the foyer the stylish powder room has cocoa-colored walls and a fashionable pedestal-style sink. A wide hallway leads from the foyer and powder room to the north wing family spaces. The ultra-private Master Suite occupies the east side of the home, and has a glass door to its own private covered deck and hot tub area. A wall of windows highlight the privacy of the setting and beauty of the natural setting. The bath is luxurious, with travertine marble floors and a slab vanity counter with double sinks, custom Alder wood cabinetry, with a wall mirror framed in matching wood. The marble decking for the bath extends with a gentle curve into the shower to form a sitting area. Large windows bring the nature’s beauty into the peaceful space. The walk-in closet has room for everything whether the clothes are hanging or folded, and features built-in cabinets. Two smaller bedrooms with private bathrooms and walk-in closets take up the west side of the home’s private wing, with a handy laundry room in between. One of the bedrooms has a built-in office desk and cabinets. Both rooms have amazing views, and bathrooms with showers. A mud room and main laundry room is located between the kitchen and the attached, upscale, 3-car garage featuring composite flooring, a dog bath, finished walls, and two extra-long bays for big vehicles. The mud room, with slate flooring, has ample space for all your coats and boots, and counters and cabinets for laundry and supplies. A carpeted, open staircase in the mud room takes you to the upper level with two bedrooms and a shared bath with a tub/shower. The comfortable guest apartment is above the detached second garage. Featuring space for four cars as well as RV parking with the separate 12’ RV-sized door, this is a garage meant for storing all your Montana toys, including the Arctic Cat ATV which is included with the purchase of the home. The garage is heated, with cement flooring and drains and a utility sink. Exterior wood stairs climb to a small deck with a front door leading to the guest apartment. The door opens to the cheerful and bright great room, with windows on three sides and a pleasing palate of cream, white, pale yellow, and blue accents. The great room has a full kitchen with laminate flooring and counters, a white Tappan 4-burner gas range, a white Whirlpool refrigerator, and a comfortable dining area. The rest of the great room is carpeted, as is the oversized bedroom with large closet and sitting area. A potbellied stove adds Montana charm to the guest apartment. The laundry room has a Maytag washer and dryer, and the bathroom has laminate flooring and Formica vanity top with wood cabinets. This is a property designed for outdoor living and entertaining. The lush backyard is full of life and possibilities. You are first greeted by the pleasing sounds of the re-circulating waterfall feature at the back of the generous paver stone patio. A covered area by the door to the great room has a big, inviting fireplace you’ll want to gather around after enjoying dinner at the patio dining table. A built-in grill station, located by the waterfall, includes a serving counter and under counter refrigerator. From the patio it is easy to watch children playing on the swing set and jungle gym set inside a special area with proper footing. You’ll want to grow your own vegetables in the walk-in greenhouse and raise your own chickens in the insulated chicken coop. There’s a fenced area connected to the greenhouse with a darling cupola and sitting area. A second vegetable garden has raised beds and fencing to keep all the wildlife from devouring all the delicious things you can grow. Further back at the edge of the woods, is the sleeping cabin and firepit for evening campfires. The land becomes wild, with paths created for ATVs and hiking. You’ll have direct access into state lands, to the magnificent Gallatin River, and will never tire of exploring and fishing. Move-in ready, the home has been meticulously maintained. It has both radiant heat flooring and air conditioning in the main home, while the guest apartment has electric baseboard heating. Most rooms have overhead fans and windows open for cross ventilation.